Blood-Red Pencil: Countdown to a Book 18: Blast Off! Countdown to a Book 18: Blast Off! 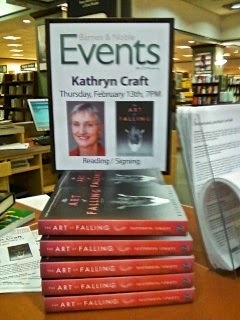 I share a certain trait with the character of Angela in my debut, The Art of Falling—a propensity for celebration. Maybe you caught on to that when I announced my book deal here a year-and-a-half ago. 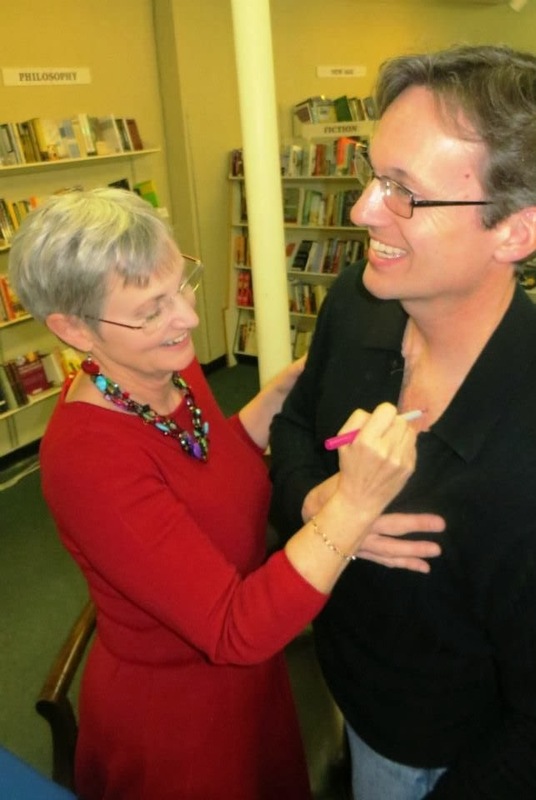 The countdown to its publication is now complete, and I recently celebrated with more than a hundred writing friends at my hometown launch at the Doylestown (PA) Bookshop, and at an after-party at the historic, newly renovated Doylestown Inn. Like that first joyous entry, I’m going to let pictures tell the bulk of the story, while tying in some of the topics I’ve visited in this series. While writing is a solo sport, in my first post I suggested that you join hands with other writers. Here I am pictured with several of the writing friends I meet with once a week at a local grocery store, laptops side by side, all of us working on our various projects. You may recall that my publisher's extensive marketing questionnaire got me thinking about all sorts of people in my life who might comprise an audience for my work. In or just outside the frame of this picture are relatives (even my brother who flew in from Denmark! ), neighbors, my former auto mechanic, my former pastor, my massage therapist, writing group members, marketing collective members, members from book clubs I’ve led, Facebook friends I’m meeting face-to face for the first time, my best friends from Ohio, writing students and editing clients, fellow board members…the list goes on and on. A special guest was my agent Katie Shea Boutillier from the Donald Maass Literary Agency. I shared how I got an agent here. Katie also had celebrating to do. 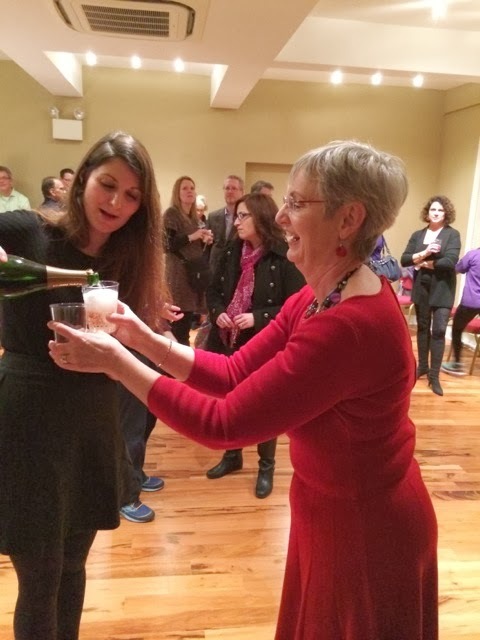 While this was her third book published, it was also her first launch party! Obviously we both believed the developmental edit we went through together was well worth the effort. In one post I told you about the care I took getting a good author photo and am I glad I did! Who knew how many places that photo would end up? While I was acting like a rock star, over on the counter and the shelves, my book—no longer a manuscript—had what it takes to sell itself. My bookstore was really happy with the number of pre-sales I drove to it. While everyone else headed to the party, they brought me a couple stacks of pre-ordered books to sign. But eventually I got to the launch party. There wasn't any food left but they showed me this picture—proof!—and I got plenty of cake, made by my talented cousin. That lovely "falling" flower arrangement was made by my sister. But the real fun was still to come: the surprise I had in store for everyone else. Turns out I wasn't so ready to leave my dancing roots in the past. With the help of students from the Bucks County School of the Performing Arts, I was able to incorporate it into the launch party while making another dream come true—my own flash mob! Thanks for taking this countdown ride with me, and I hope you learned as much as I have along the way. Click here for the evolving list of my signing, speaking, and blog tour events. 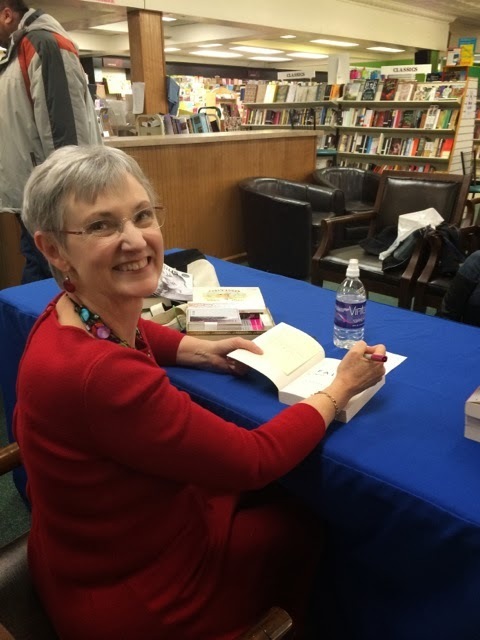 You can request a signed, personalized copy from the Doylestown Bookshop and they'll ship it to you—or if you already have a copy, contact me for a signed custom bookplate! Now—back to writing the next book, which they say is the best way to sell your last one! 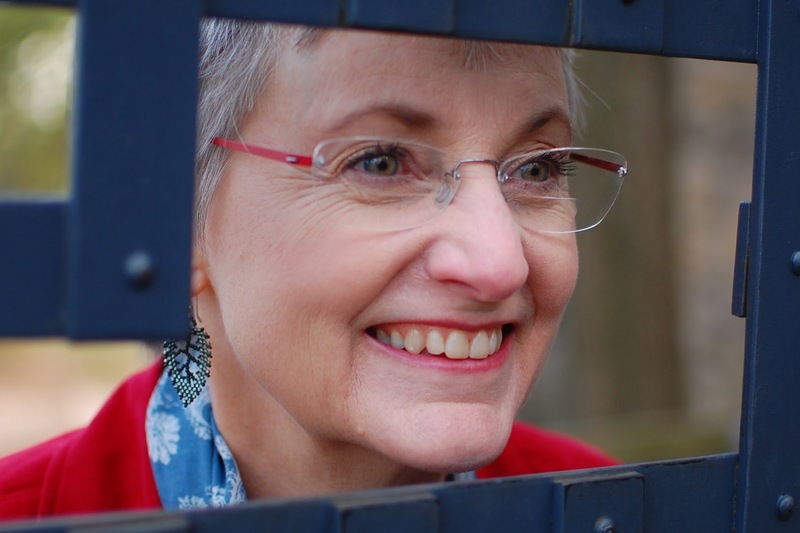 Kathryn Craft is a developmental editor at Writing-Partner.com, an independent manuscript evaluation and line editing service. 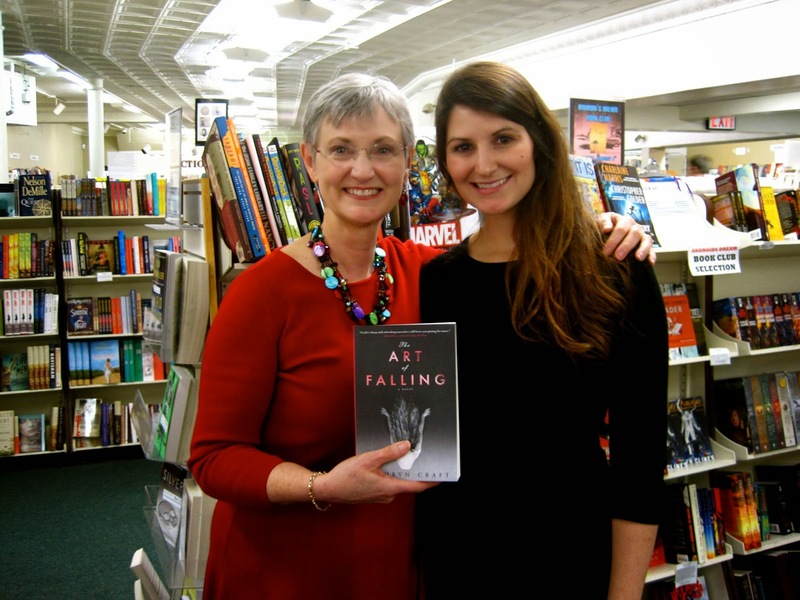 Her monthly series, "Countdown to a Book," details the traditional publication of her debut novel, The Art of Falling, by Sourcebooks. It is now available for pre-order. 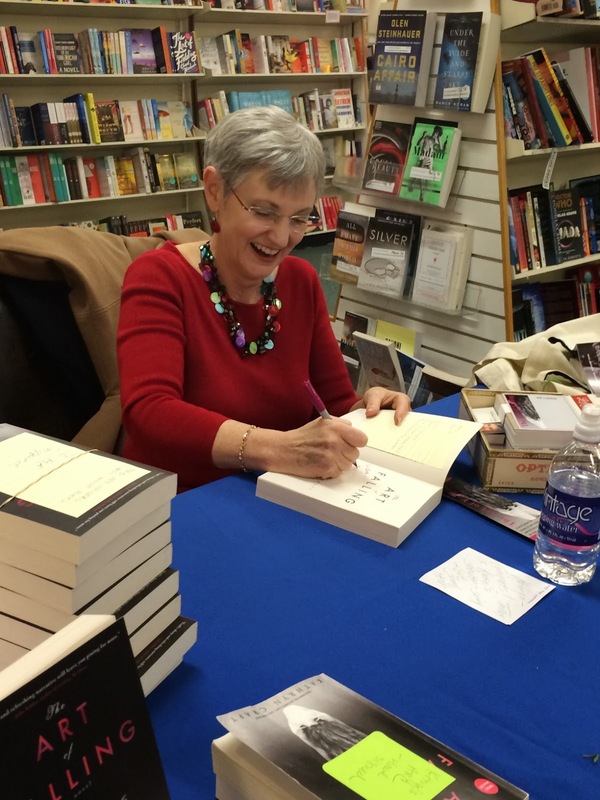 Her monthly series, "Turning Whine into Gold," appears at Writers in the Storm. Connect with Kathryn at her Facebook Author Page and Twitter. Must be a heady feeling. Thanks! Today was particularly fun—a TV spot, a USA Today mention, an awesome review. FUN!! I can't believe they didn't save you any food! But - your very own flash mob! Brilliant! Elle—believe it or not the flash mob was my sister's idea! I've always loved them, and was a dancer, but didn't see the forest for the trees. Thank goodness for team members! 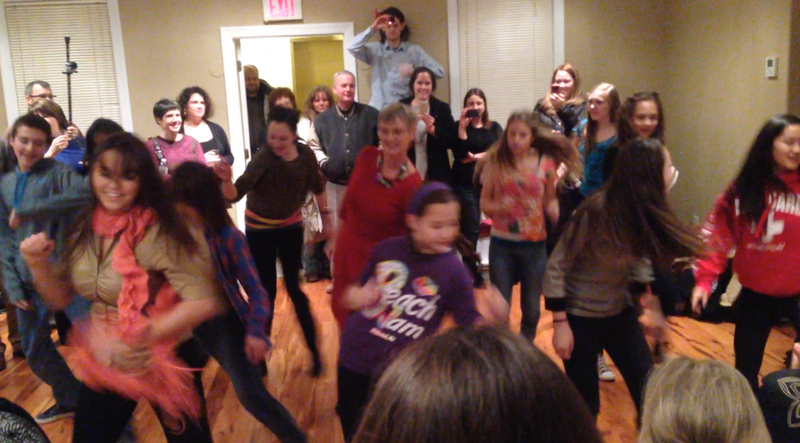 What a great party, and I, too, love the flash mob. I am so thrilled for you. Sharing your journey with this process has given us lots of insight on how to successfully prepare for a book release. Thanks Maryann. When I went to those flash mob rehearsals so that I could join in at the end, I realized just how perfect incorporating the dance was. The music, Katy Perry: "You're gonna hear me roar!" Wonderful! Congratulations and best wishes for many more books and launch parties to come! Thanks Wendy. You never know what's to come (the sudden changes in 2008, anyone?) so I figured I better celebrate with gusto while I had the chance! Wow ... congratulations, Kathryn. Everybody loves a party. Thanks Christopher! This one was a biggie for me! I'm so happy for you. Enjoy the elation. Now get back to work. They'll expect you to do it again. LOL. I know, my next book is due June 1! Eek! Sharing your journey with all its ups and downs has truly been an inspiration, Kathryn. For those who haven't yet taken that trip, who don't have a map, and who can't quite see that lovely party at the end of the road, it shows them the way. Aw, thanks Linda! I case anyone takes a cue here, despite Linda's love for lofty alliteration, it's "Doylestown," lol! Beautiful, Kathryn. And you look stunning in red, my favorite color! Have you thought of spinning these 18 posts into an e-book how-to? I think you have shared some incredible information with us, and re-purposing it would not be an unreasonable idea. Yes, at the very least a pdf download at my website, with homage paid to my original publisher of course! What a wonderful journey this has been for you! I'm very proud to know you! Thanks Heidi. *Blushing* I'm truly having the time of my life. How wonderful to share in your dream come true! Interesting and informative way to let everyone enjoy your success. Great pictures. I was right there with you even though I was watching from East Texas. Your book is on its way to my front porch.